Sexsmith Heritage Park Campground is a beautiful getaway destination whether you are travelling along the Alaska Highway or whether you need a home away from home for work during the summer months. 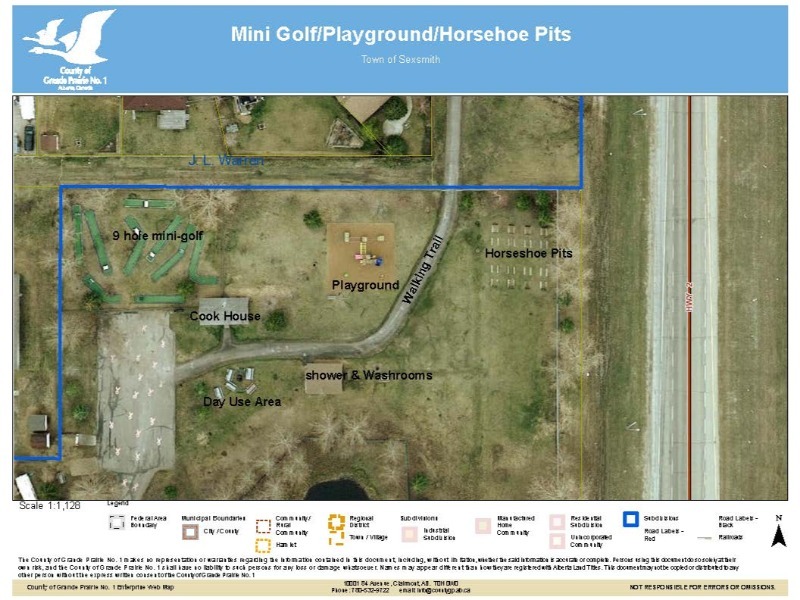 Heritage Park offers many free amenities - firewood, flush toilets, showers, sanii-dump, 30 amp power and water, fire pits and picnic tables at every site, 9-hole mini golf, horseshoe pits and a stocked trout pond. Sexsmith also offers a series of interconnected walking trails. The Town of Sexsmith boasts an authentic 1920's-1930's main street complete with gazebo, heritage clock, period lighting and a working blacksmith shop. Stop by the Sexsmith Town office to grab your map for a historical tour of heritage homes and sights. See the home of renowned midwife Johanna Haakstad who assisted the new babies into the world and at that time was the dubbed the "Nightingale of the North". Stop by and grab a photo in front of the authentic NAR caboose donated by CN Rail in 1985 and located next to the historic NAR train station which was constructed in 1928 and is downtown in front of the towering Sentinel - the last remaining grain elevator in the community that was known as the "Grain Capital of the British Empire". Sexsmith also has a splash park, skateboard/BMX park and interconnected walking trails throughout the Town. Grande Prairie is 20 minutes away for swimming pools, movie theatres, hardware stores, restaurants, shopping and more. Also be sure to check out the renowned Phillip J. Currie Dinosaur Museum in Wembley, Alberta - 20 minutes from Sexsmith. All Tents must pay the same as trailers etc. If you wish to cancel your reservation and receive a refund, we require a notice of a minimum of 3 business days (with noon being the starting time). All cancellations will be subject to a $5 service fee. There will no exceptions, regardless of the circumstances. No generators running after 11:00 p.m. to 7:00 a.m. Maximum two tents per stall. Modifications are subject to a CDN$5,00 (five) fee. Total silence must be respected between 11 p.m. until 7 a.m. Bookings cannot be amended within 3 day(s) of arrival. We require 72 hours cancellation in order to receive refund on entire reservation. Weekly and monthly rates are to be pre-paid. If not pre-paid, stalls will be charged out on a $25.00 per day basis. Arrivals: From 2:00 p.m. until 6:00 p.m.